Kuta is a haven for surfers and young people alike. The town sprawls for several miles inland away from the beach, providing plenty of room for cheap accommodation and a very active metropolitan area, as well as the upmarket beach-front holiday resorts that are common to the rest of Bali. Not as classy as in Seminyak, but restaurants are plenty and varied. The epicentre of nightlife in Bali. Kids will love the waterbom water park and life on the beach. Some of the best massages are given by blind therapists. For the adventure seekers tour operators arrange day or longer trips out of Kuta. Both the Tuban and Kuta beaches are a little glimpse of heaven. Gorgeous warm waters lap onto a picturesque sandy shoreline, with enough sizable waves out in the friendly ocean to make them a real dream for visiting surfers. The beaches do get quite busy, but when you’re young and having fun in the sun, who cares how crowded the beaches get, especially when there’s still plenty of room for everyone. In the evenings the town is usually treated to a sunset the beauty of which is arguably unrivaled. The setting sun often paints the sky with vivid reds, purples and oranges, making for an absolutely breathtaking sight for those looking out across the ocean. The stunning view isn’t all that Kuta has to offer at night, as it is also one of the most active party towns on the whole of the island. Partying in Kuta doesn’t mean having to spend a fortune, as its youthful scene makes sure that the bars and clubs cater to those without a great deal of money. Cheap alcohol flows freely during the nights in Kuta, with a wide range of music venues available to help keep patrons entertained whilst they indulge themselves in the local spirits. The town itself is a bit of a maze, having been clearly extended multiple times in the last couple of decades. There are all kinds of shops to visit in the town center, though most of them are the same kind of shops you can expect to find in any resort based town, selling a range of local merchandise alongside holiday essentials. The restaurants in Kuta are fairly good, as well as being modestly priced, with a wide range of international dishes available for purchase. There are a few high end restaurants available, but for the most part people tend to eat based on where they intend to spend the night, making the waterfront cafe’s just as popular as the inner town eateries. All in all Kuta provides an excellent taste of what Bali has to offer. There are certainly more specialized and upmarket areas of the island to visit, but for people who just want to have an amazing beach based holiday, Kuta is the place to be. 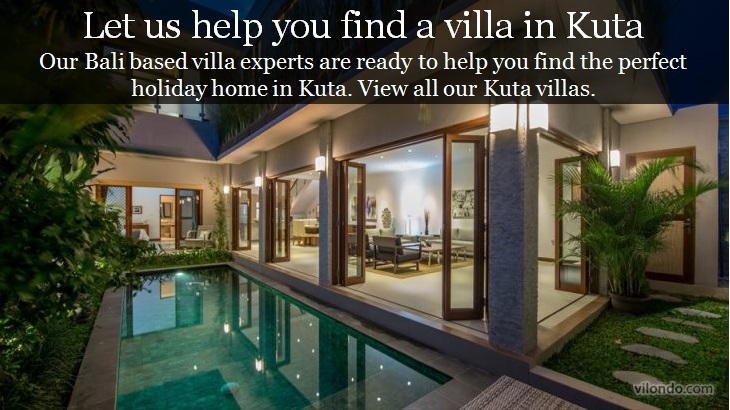 If you want to stay in style, take a look at our villas in Kuta.